Ok guys, despite loving my adopted city of New York, after spending a day and a half in Quebec, I think I can safely say that it's one of the most beautiful cities I've ever visited. A gorgeous old town that looks like a French village, old army battlements to explore, plentiful parks for running, and delicious food? Sign me up. 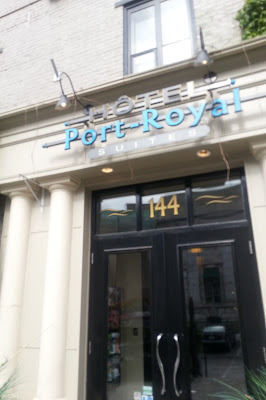 We stayed two nights at Hotel Port Royal. The hotel had a fantastic location, right near the water and in the lower half of old town. It was easy to get around, which is a plus, and there were even welcome cocktails for us! Our room also had a kitchenette so we could make tea and coffee, and we could have cooked if we'd wanted to get groceries. But who wants to cook when you could eat food like this? We had a fantastic breakfast at Le Cochon Dingue yesterday morning, a short walk from our hotel. Our waitress was friendly and helpful, our meals were delicious, and the price was very reasonable for Quebec (nothing seems to be "small city prices" here, unfortunately). We had dinner Sunday night at Echaude, and although my dish wasn't very flavorful, the appetizers my parents and I shared were terrific and my parents raved about their dishes. 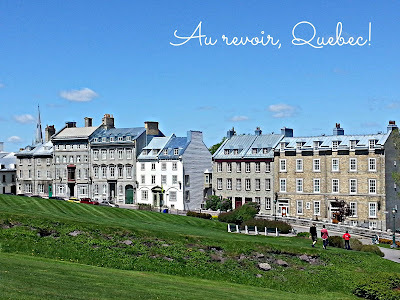 I also had a great Quebecois sparkling white wine there! Monday night we had a really great dinner at Bistro Sous Le Fort. 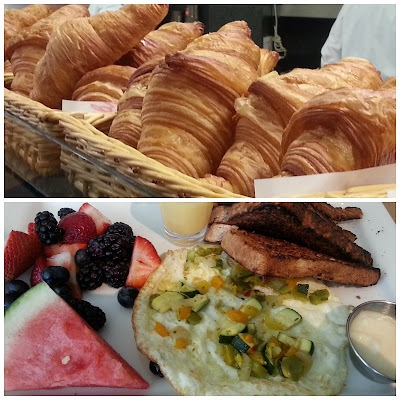 Every dish was tasty and the service was terrific. Prompt and friendly, just the way I like it. I'd recommend both these restaurants for dinner if you're ever in Quebec City! They're both in the lower part of old town. 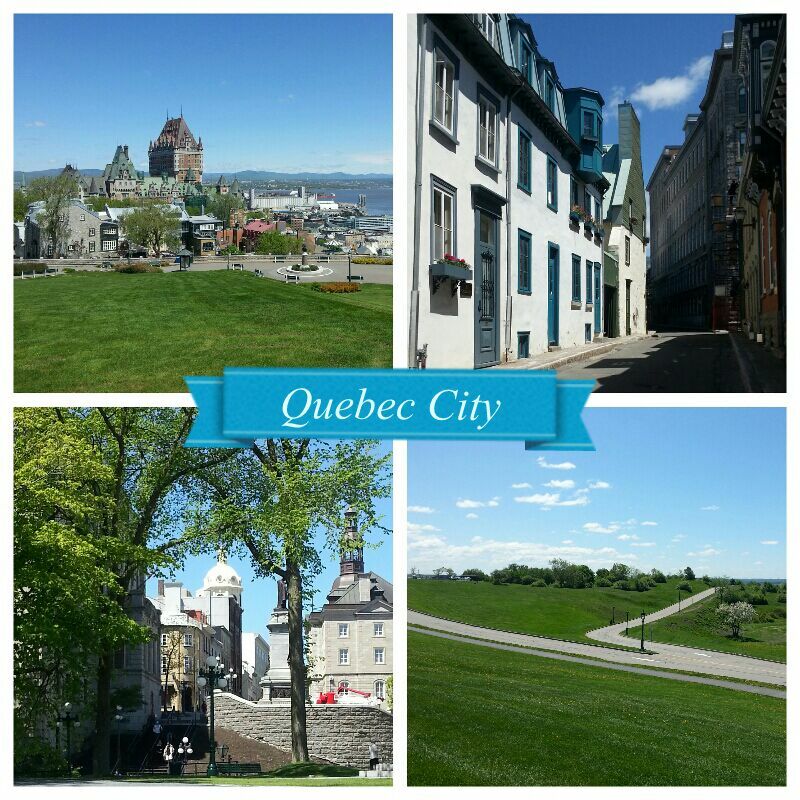 Quebec is known in part for the beautiful large red hotel, Chateau Frontenac, that dominates the skyline in Old Town. 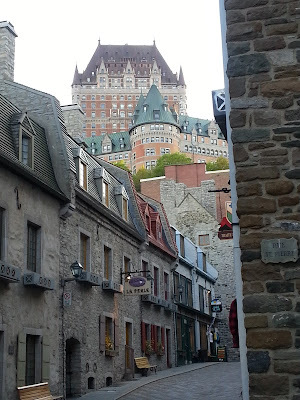 It opened in 1893 and is now owned by the Fairmont company, so it's technically the Fairmont Chateau Frontenac. The WWII Quebec Conferences, where D-Day was planned, were both held here! By the way, the city is extremely hilly since it's basically built on the edge of a river gorge. 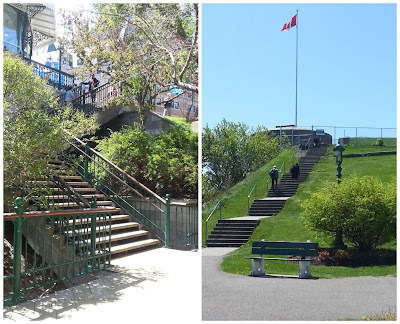 It felt like we were continuously going up or down staircases and hills! 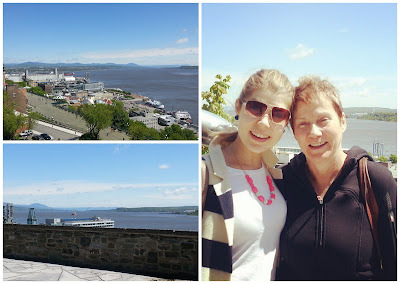 Quebec City looks out over the beautiful St. Lawrence River, and the higher you climb the more beautiful the view. I'm so grateful that Monday was so clear and gorgeous or we would have missed the incredible vistas. 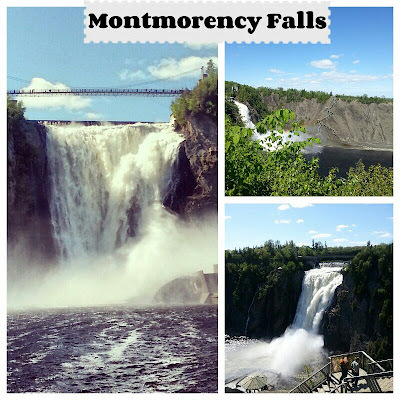 Only a 15 minute drive from downtown Quebec is Montmorency Falls. This may have been the highlight of the trip for me because the falls were so awe-inspiring -- they're 98 ft. taller than Niagara Falls! Check out the staircase in the top right! We walked along the suspension bridge over the falls, climbed down the staircase to see the falls from below, then went right back up 28 flights of stairs (I counted) or ~450 steps (my mom counted). If you visit Quebec City, make sure you head out of town for a quick hour or so to check out the Montmorency Falls because they're absolutely spectacular!! I didn't wear workout gear to the Falls, unfortunately, but if I had I would have gone up and down the stairs multiple times. There were quite a few people with water bottles and shorts on, clearly getting in their workout by doing stair repeats. I can't think of a cooler way to get in a cardio workout than climbing stairs by a giant waterfall! Our trip is ending today as we drive back to New York City, but my parents and I are already plotting to meet in Quebec City for Christmas someday. It's only a 1.5 hour flight from NYC! I can only imagine how lovely this picturesque place would be with a covering of snow. Sadly, going back also means saying goodbye to my parents, who are flying back to Washington State on Wednesday. Thankfully I'll see them again in September! By the way, did you hear about this bridge collapse? It's on the main route from Seattle to my parents' house! How was your Memorial Day weekend? Have you ever been to Quebec City? And how freaky are bridge collapses??? That sounds pretty good to me! 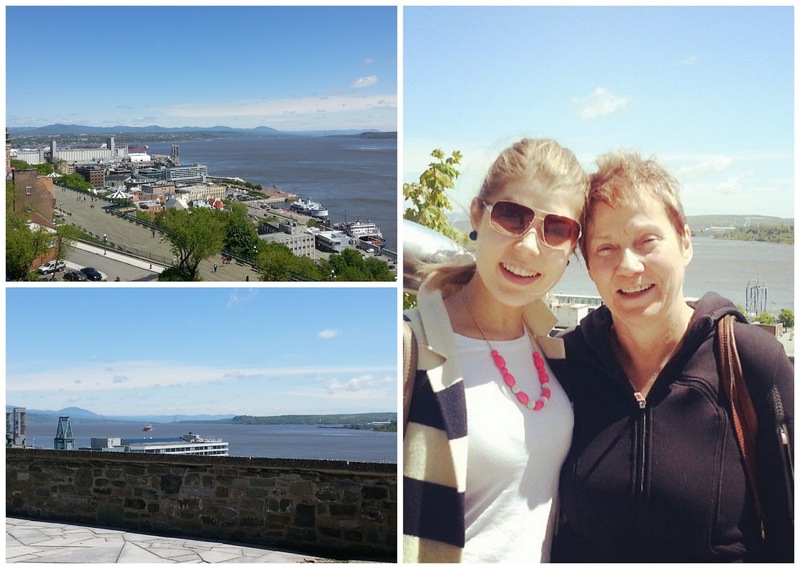 How cool is Quebec? Pretty awesome that it's this totally different place right across our border, as opposed to the rest of Canada that seems pretty similar. What a lovely trip, it looks so quaint, and perfect for a relaxing vacation. Anything else I did pales in comparison!